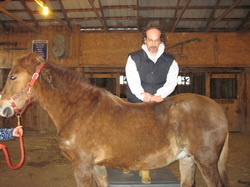 How do you adjust a horse? -A change in behavior or appetite. There are lots of ways the chiropractic adjustment benefits all of us. Only an assessment by a qualified Animal Chiropractor can determine if chiropractic care is best for your animal at this time. Most animals really enjoy their chiropractic care. Just like us, their nervous systems must be free of interference in order to function properly. The chiropractic adjustment allows the animal's nervous system to function more optimally, so that it might return to a better state of well being, and perform at its best. 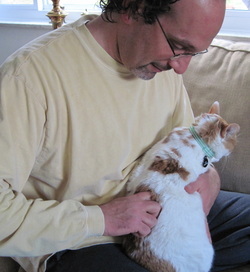 Some version of chiropractic care for animals has existed as long as there has been chiropractic. Animal Chiropractic has grown and developed significantly since the mid-1980's as a specific discipline, aimed at providing optimal well-being to our animals, just as it always has for people. Call them at 724-216-5174 for an appointment. Large animals are seen by appointment. Call Dr. Halden at 412-731-9441 to arrange an appointment. Chiropractic care of animals is not a substitute for veterinary medical care and advice, nor will an animal chiropractor diagnose or treat animal diseases or conditions. 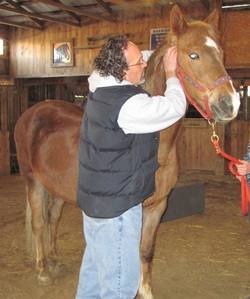 Dr. Halden is a licensed chiropractor, who has trained extensively in Animal Chiropractic. .
Everyone asks, "How do you adjust a horse?"